This topic has buzzed about inside my head like a nagging tooth for several months now. Lying in bed the other night during a power cut I listened to the radio through tiny earphones attached to my mobile phone. It was the jolt needed to pull it together. My mobile is a Nokia 6610i, still giving faithful service after three years. It measures 10.5 x 4.5 x 2cms. I tucked it under my pillow to stop it slipping down the back of my bed, Tissues, reading glasses – the spare ones for reading in bed, my phone and medication have at times found their way through that tiny space. The bed is heavy and pulling it out is an activity endured only when necessary. It is a far cry from the radio we listened to when I was growing up many years ago. That radio was a piece of furniture, an unmoveable feast! The first time I actually realised this was at secondary school, one of my class mates was talking about how she lost the radio. She searched the house for it before finding it under the bed! Our radio was larger and heavier than a family sized Microwave. It lived on top of Daddy’s desk in the alcove beside the fire. Daddy’s chair was always within arms reach of it. No way could you lose it or fit it under a bed! 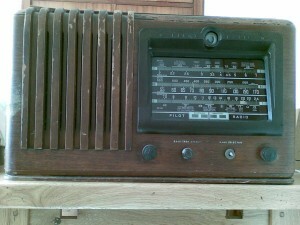 The radio is still about although it has not worked for years. Brother No.2 took it when Daddy died with the hope of finding parts and getting it going once more. Unable to find the items required and not wanting to part with this token of our /his past, it sat in his mini museum alongside his other treasures of an earlier life. Slowly over the years it has moved along the shelf until finally it was relegated to a high shelf in the utility room where it sits today looking forlorn and unloved. This radio arrived all bright and shining to our home as a wedding present for my mum and dad in 1941. There was a choice of wavelengths; long, medium and short. My earliest memories are of Radio Eireann and BBC Home Service. Daddy had the habit of tuning in to BBC Home Service for the 7am Morning News programme and switching over to Radio Eireann for the 8am news. Mammy loved to listen to the afternoon play on BBC as she waded through a mountain of ironing, with the help of a bar of Cleeves Toffee. On Christmas Eve we followed Santa’s preparations with the elves checking the gifts for all the children before leaving the North Pole. Somehow it never registered that all the names called out were Irish or had an Irish touch to them! Lunchtime listening in our school years brought regular episodes of the Kennedy’s of Castleross and a very staid version of Hospital’s Requests on a Wednesday. The latter seemed to play only classical music, Irish diddlie di, or hymns. John McCormack’s recordings were regularly requested The messages of greeting for patients were delivered in very sombre or grave tones, enough to add pain rather than bring comfort. Then a young Bank Clerk from Limerick called Terry Wogan arrived like a tornado blowing fresh air across the airwaves. He spoke irreverently of Matrons, bedpans and pills and the ludicrous reality of lunch at 11am. The programme changed Tempo and we were introduced to the music of the day. I am sure it had a very positive effect on patients who in those days had longer spells in hospital. A simple appendix operation meant a week in bed followed by a week up and about on the ward. That is how it still was in 1966 when my appendix was removed. Most of that happened before TV began in Ireland. We listened to the radio and made our own pictures inside our heads. Paddy Crosbie was Question Master of The School around the Corner, where each week, two teams from different Primary schools battled it out to show their knowledge. The programme always finished with the ‘Hard Word’, when Paddy asked each member to write down the meaning of a multi-syllable word. The answers were then read out to the listeners and everyone shared the prize of a box of sweets. Question Time, for the adults was watched over by our other dad patent leather hairdo Joe Linnane. My mother dated him before she met my dad. We never actually met him, but were glad she chose dad. It didn’t stop us teasing her every time we heard him or saw him in later years on Radio Telifis Eireann. We had a weekly series of the Foley Family, an early attempt at radio soap. There was Cheili House, a programme of traditional Irish music, and Take the Floor with Dingo – did he have another name? Dingo was the compère; he introduced the musicians and dancers and was caller for the dance steps just like at a barn dance. As a child I thought it was silly having dancing on the radio as you couldn’t see the steps, mind you I feel the same about cooking on the radio today. Joe Lynch, from Cork was another entertainer, who grew-up within Radio Eireann as an actor, singer and comedian, but really came into his own with his Living with Lynch. I remember a detective series where the story built over several weeks. One week there was a car chase through the streets of Dublin, ending with the criminal crashing into a railing near the Four Courts. We were on the edges of our seats and chewing our fingernails with the tension and excitement. It was all the more believable when the following day; Daddy piled us into the car and took us to see the crash site. There was the car stuck in the railings! Daddy had heard of a crash on the news but let on to us that it was the car from the programme. Somehow I don’t think that would pass the children of today. My older brothers graduated to Radio Caroline and Radio Luxembourg and we became interested in the Top Twenty and all the hits of the day. If mammy and daddy were out we played about with the dials and wavelengths, sometimes we managed to eavesdrop on ship to shore telephone calls. Usually it was one side of a conversation, but if we managed to get both sides we felt we were very clever. Now we have digital this and digital that, instant satellite connections across the globe. We hear and see the news as it happens and at times before it happens. Journalists today are in such a hurry to be the first with the news that they they tell us what they think will unfold. Does the fast pace make the news any better or make us happier? This entry was posted in memories on May 14, 2008 by Grannymar. Arthur – I suggest you contact RTE about their archives as I know nothing about them. SK – If memory serves me well, The Foley family, were years before Harbour Hotel. I don’t see any of my replies or input about RE posted,,,Have I done something wrong, ??? or are you not interested of past history on RE. I have such distant memories of radio Eireann and indeed radio programmes in general. I recall winning a telescope and some nature books on J. Ashton Freemans radio programme. Also I won a few times on Marion Kings “Drawing and Painting” Denis Fitzgibbon “Din Joe” was married to a cousin of my Mothers. I am still going strong, planning a train trip to Moscow this Spring, and I have recently joined a writers club in Galway. Other members marvel at my contributions, not because of my literary expertise so much as my vivid memories of things past. I like your website. I like the sound of your train trip to Moscow next Spring, and would love to read all about it on your return. Joe – Pity you don’t have some of those postcards to take with you to the Russian Embassy they might find them interesting. I still have all the cards and other items that I was sent all those years ago. But I hope when I call to their embassy in Rathgar later this week, that they will find time to talk to us. I am off now to our writers club. We missed last weeks, because of the weather conditions. This meeting each week is very important to all of us, and has a mixed bag of members, Doctors. academics, and in general people who have tasted the experience of life. Everyone has at least one book in them. Take care now and keep up the good work. Din Joe was in fact Denis Fitzgibbon. A Cork man, his day job was that of General Manager of Volkswagen Ireland. He was married to a cousin of my mother’s. I also recall from radio of long ago, Marion King who did a programme on drawing and painting. I won prizes on this for my artistic endeavors. I also won prizes for writing short stories on a programme presented by J. Ashton Freeman. Memories…memories….memories. Welcome PJ, Glad to jiggle the memory box for you. I too remember J. Ashton Freeman’s programme. Anyone ever have episodes of harbour hotel or any memorabilia ? It never gets a mention anywhere considering how long it was on for ! Sk – You asked questions about harbour hotel back in 2010, but nobody picked up on it. Sorry, I am of no help. Try RTE. To John and Joe Keane, I have written a new post with both your comments on it to appear on Tuesday 14th August from 06:00hrs. If you scroll up to the calendar over on the left hand side and click on 14th (after 06:00) it will take you to the post. Pingback: Grannymar » The Radio switches on again.